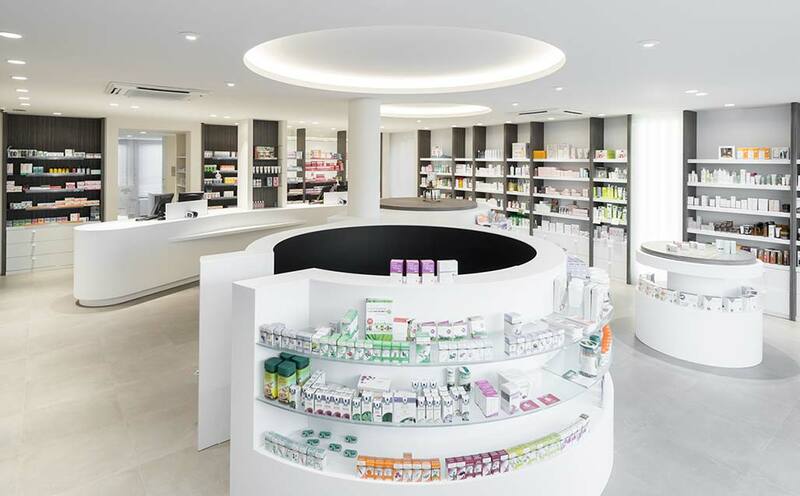 Belgian studio Lijnen & Partners was in charge of the contemporary, elegant design of the Farmacia Rooseleers pharmacy in Beringer, Belgium. It is a bright space that combines KRION® Snow White 1100 with natural wood, two materials which combine perfectly to create comfortable atmospheres where Lijnen & Partners masterfully integrate aesthetics and functionality. We can find the Solid Surface from PORCELANOSA Group, KRION®, within the Farmacia Rooseleers, in much of the premises. In the middle there is an amazing large curved piece, with a multitude of applications, a children’s play area, displays, and a bench – all in one piece without perceptible joins, created by transforming company L&P interieurproductie, a subsidiary company of Studio Lijnen & Partners, completing a quality work, beginning with the design and finishing with the production, maintaining a balance where reliability, resistance, and love of details ensure a high quality result. KRION® is also dazzling in Farmacia Rooseleers in its transformation into a counter, shelves, worktop and units.